It’s road trip time! 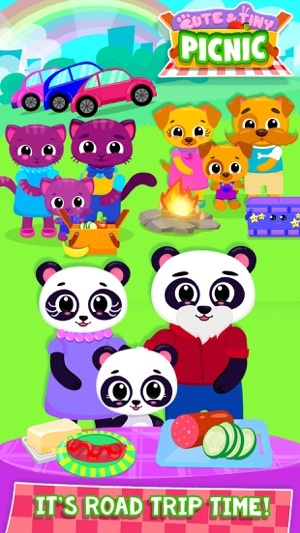 Go on a nature trip and have a fun family picnic in the park with cute and tiny baby animals: kitty Sue, puppy Bu, bunny Blu, piggy Lulu and panda Choo! Pack picnic baskets for the trip, cook yummy picnic food, have a tea party and don’t forget to be responsible and clean up trash in the park! Have fun and enjoy your family picnic! 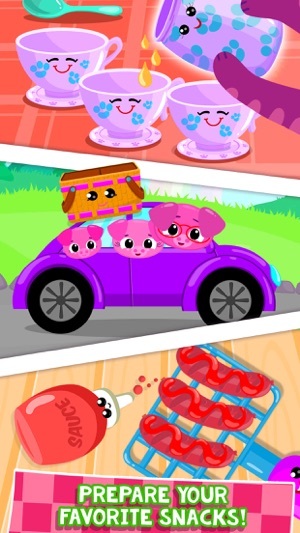 The cute and tiny animal families have their own favorite picnic foods! Help the kids and parents cook their fave dishes! Cute puppy Bu’s family likes to have a family BBQ and grill sausages! Baby bunny Blu and his parents prefer yummy picnic sandwiches! 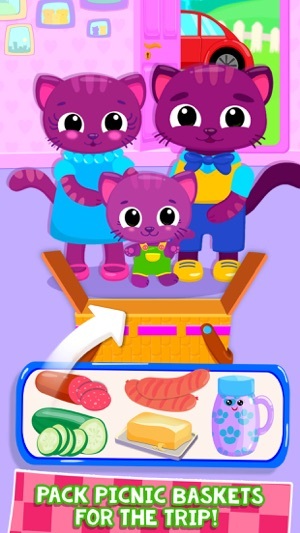 Kitty Sue’s family wants to have a tea party with a sweet cake in the park! 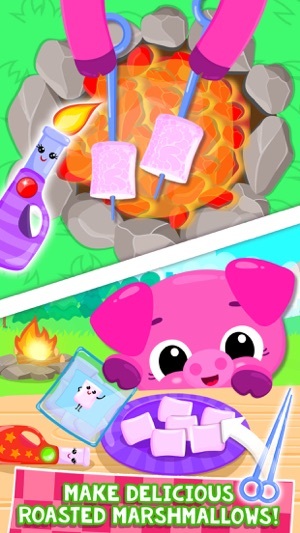 Tiny piggy Lulu and her parents love roasted marshmallows! 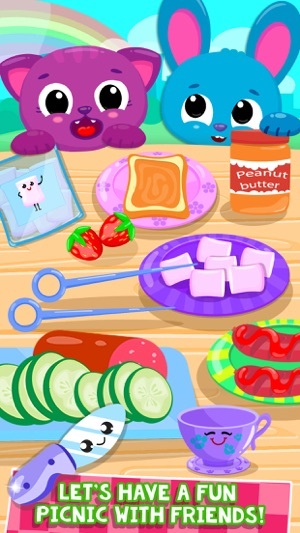 Little panda Choo’s family likes sweet sandwiches with peanut butter and fruit! Mmm, picnic food is always yummier for kids! Don’t forget to always be responsible in the park, kids! Put out your campfire and clean up the trash! Learn to recycle! Put food, plastic and paper waste into correct trash bins! Good job, little one! The park is clean and pretty again! Come back for another fun family picnic and tea party! Cute and simple graphics. Kid-friendly interface. Safe environment for playing and learning. Suitable for toddlers and younger kids. 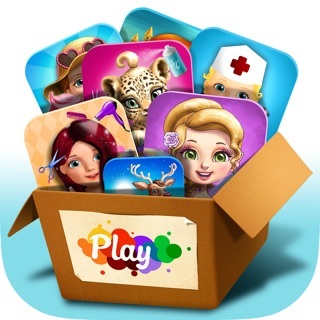 Cute & Tiny games are carefully crafted specifically for the youngest kids (ages 1 to 3). 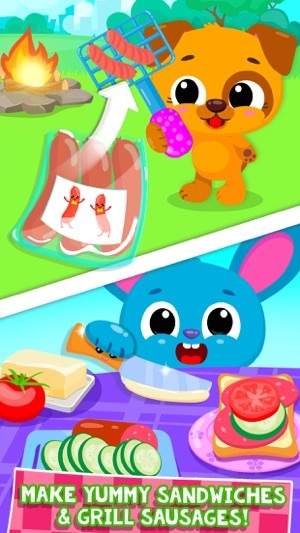 While covering various topics, from pet care to car service, all Cute & Tiny games teach toddlers kindness, help them develop fine motor and basic social skills and, of course, bring smiles to their faces! If you have any questions, email us at info@zaidimustudija.lt. We’ll be happy to help you!